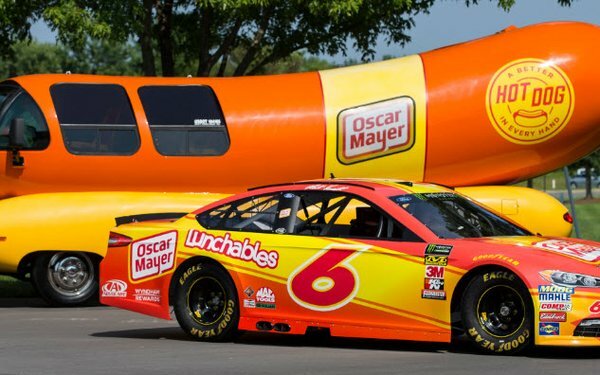 Oscar Mayer has signed to be the official primary sponsor of Matt Kenseth’s No. 6 Roush Fenway Ford Fusion at the Southern 500 at Darlington Raceway on Sept. 2. The car will now be considered an honorary part of the Kraft Heinz brand’s WienerFleet, most recently joined by the JetPack-powered Super Hotdogger. Oscar Mayer was an associate partner at Roush Fenway Racing in the early 2000s. The brand was featured on Kenseth’s No. 17 Ford and Kurt Busch’s No. 97 Ford, when NASCAR Hall-of-Fame owner Jack Roush led his stable to back-to-back Cup championships in 2003 and 2004.